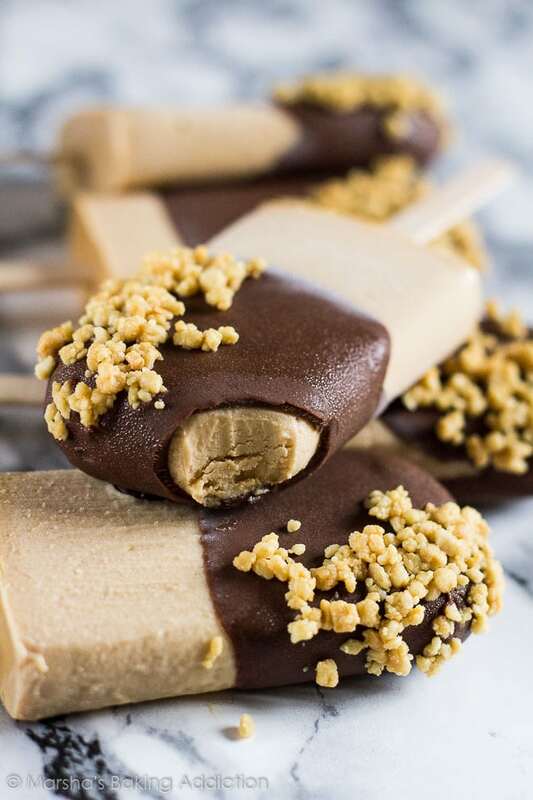 Chocolate Peanut Butter Yoghurt Popsicles – Deliciously creamy and fudgy peanut butter yoghurt popsicles dipped in chocolate and sprinkled with crushed salted peanuts! Chocolate and peanut butter… One of my all-time favourite combinations. Today, I’ve turned that combination into a popsicle. 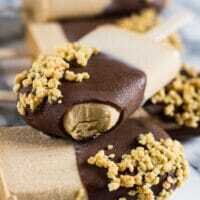 I bring you my Chocolate Peanut Butter Yoghurt Popsicles! These are my favourite popsicles. They are incredibly creamy and fudgy, and bursting with peanut butter flavour. 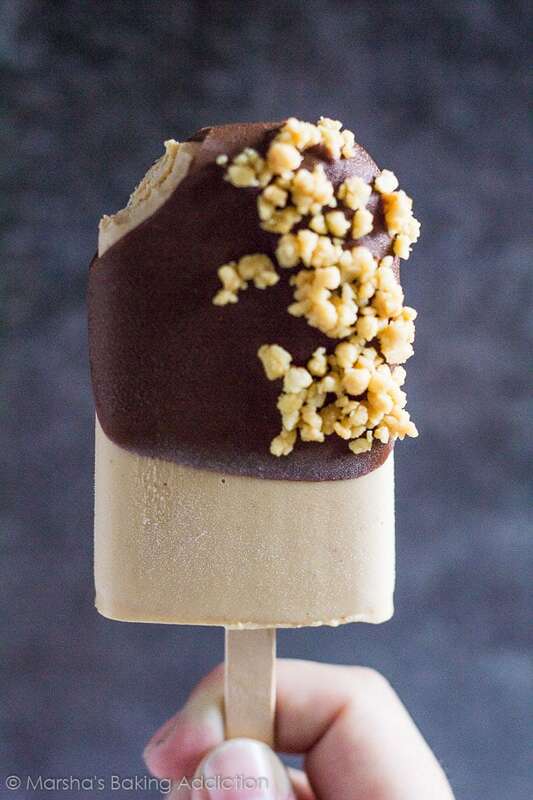 These popsicles paired with the chocolate and crushed salted peanuts are just divine. 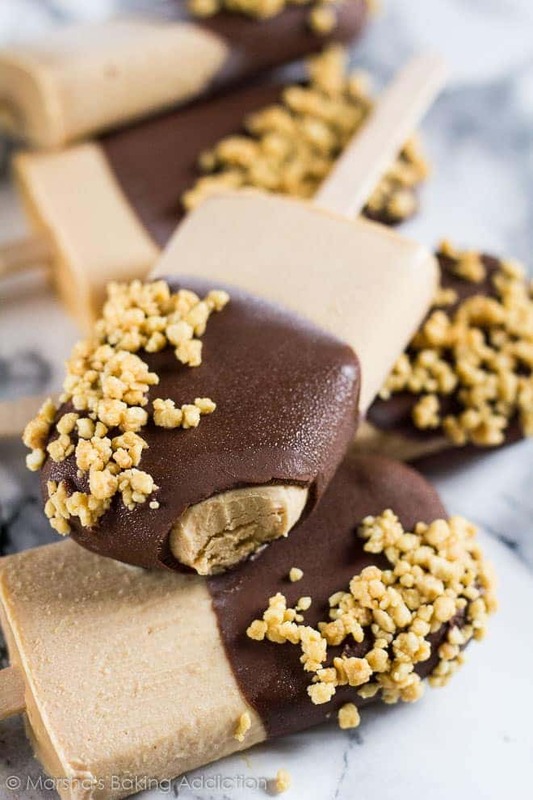 These peanut butter popsicles are made with only 4 simple ingredients! Smooth peanut butter, vanilla greek-style yoghurt, milk, and honey. The topping is chocolate and coconut oil melted together, a little peanut butter stirred in, and a sprinkle of crushed salted peanuts. The perfect topping for these delightfully creamy popsicles. 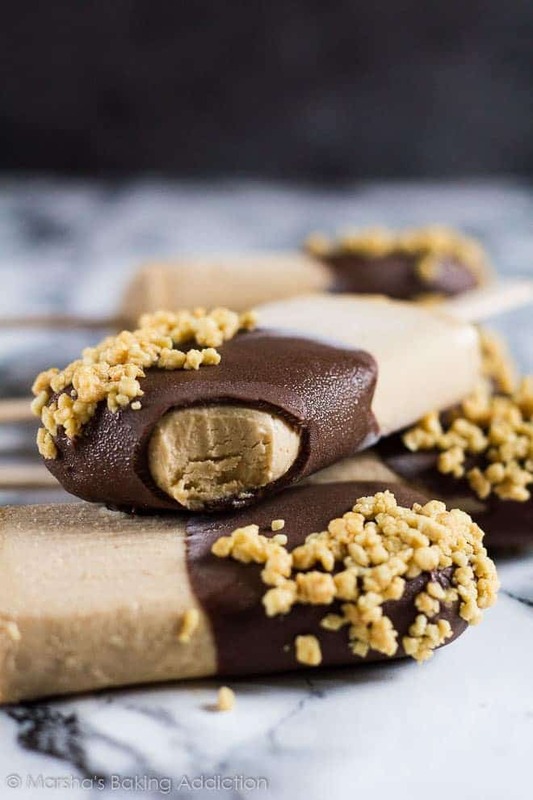 If you love peanut butter and chocolate, these popsicles will soon be your favourite, too! Don’t skip the salted peanuts, I highly recommend these popsicles with them, because they enhance the flavours so much! More popsicle recipes to try! 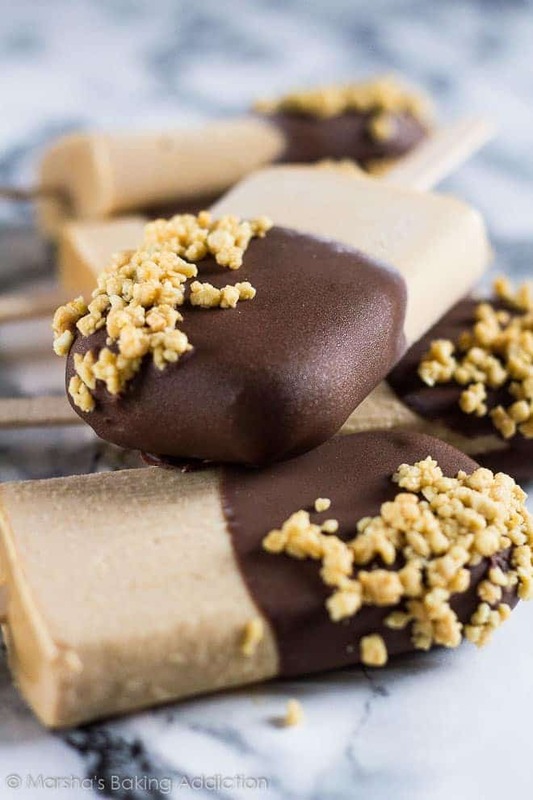 Deliciously creamy and fudgy peanut butter yoghurt popsicles dipped in chocolate and sprinkled with crushed salted peanuts! Whisk together the peanut butter, yoghurt, milk, and honey until smooth and combined. Pour the mixture evenly into 6 popsicle molds. Freeze for 2 hours before putting wooden popsicle sticks in the centres. Freeze for a further 4 hours or overnight. Microwave the chocolate and coconut oil together until melted, stirring every 20 seconds. Stir in the peanut butter. Allow to cool for 5 - 10 minutes. When ready to serve, run the molds under warm water to remove easily. 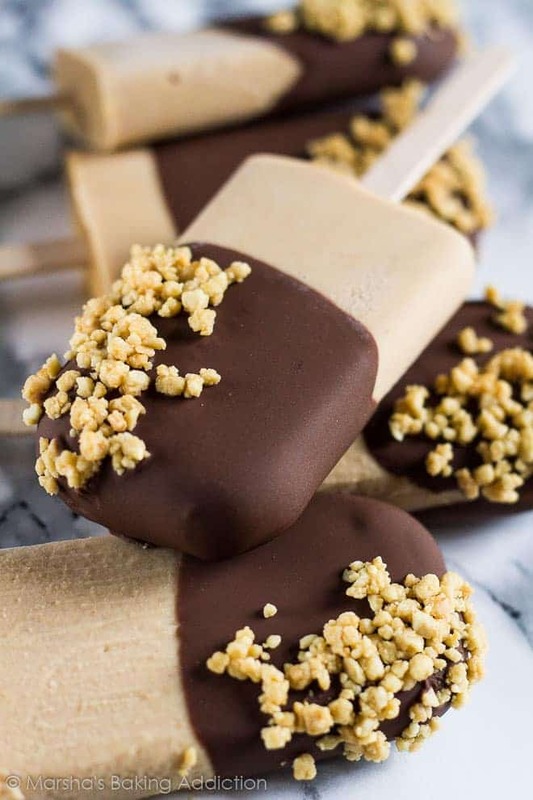 Dip each popsicle in the chocolate, or drizzle on top. Sprinkle with the chopped peanuts, and serve immediately. These popsicles are so pretty, Marsha! Love that chocolate dip and the crushed peanuts are icing on the cake…er crunchy on the pop? 😉 These look perfect, girlfriend! Cheers! such decadent looking popsicles! as hot as it’s been, I’m dying for one of these right now!! Too bad I can’t pluck one from the picture! I love the look of these, I don’t really have much of a sweet tooth so the slightly salty savoury notes make them a real winner for me! I am such a peanut butter and chocolate fan – I know I would absolutely LOVE these! They’re on my To Make list now for sure! Gorgeous! You have been killing it with these popsicles lately, Marsha! This one might be my favorite yet. And I love how they’re topped with additional peanuts! These look delicious. I make my own yogurt. Is the vanilla yogurt you mention flavored with vanilla, or is it plain yogurt? These popsicles looks so delicious, can you please tell me what kind of chocolate should I use or can I use morsels? Also what kind of coconut oil, the liquid oil or the creamy looking one in the jar? This will be my very first recipe using coconut oil. Thank you for sharing your recipes. I’m new to this site and I’m excited to try so many recipes on here. Hi Arlene! I used dark chocolate here. I would use a good quality chocolate that you love eating on its own. The coconut oil is cold-pressed in a jar 🙂 Enjoy! I live in England and not sure if I can find the coconut oil, any suggestions for alternative. I can’t wait to try these, I adore peanut butter and chocolate. These look so scrumptious!!! I was browsing on Pinterest and they were literally staring at me. A fantastic recipe for a hot summer day. I love the peanut butter chocolate combination too, it’s the best one! Do you know if you can use a non-dairy yogurt substitute?